A sudden dimming in brightness of Tabby’s Star, famed for its large and puzzling fades, has triggered a frenzy of observations as astronomers hurry to try to get to the bottom of what is rapidly become one of the biggest mysteries in astronomy. 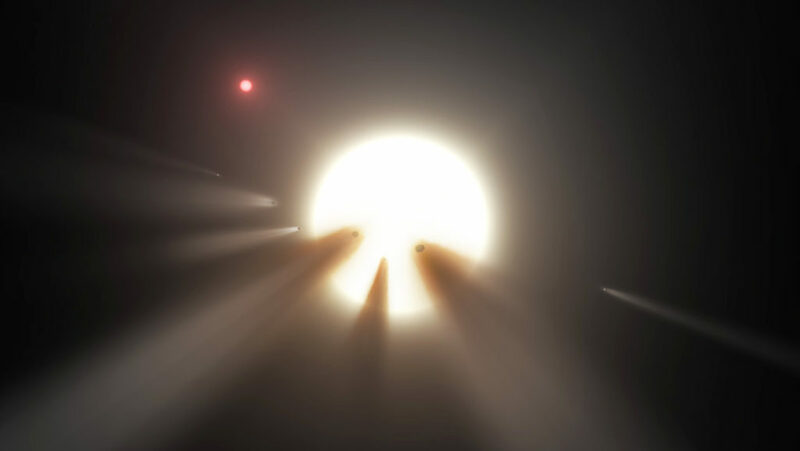 Comets are just one possible explanation for the strange behaviour of Tabby’s Star. Image: NASA/JPL–Caltech. 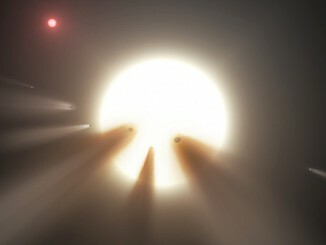 The astonishing behaviour of the star, also known as KIC 8462852 or Boyajian’s Star, was first detected by citizen scientists looking at data from NASA’s Kepler Space Telescope on the planethunters.com website. The aim of the website is to give citizen scientists the chance to search for transits of exoplanets that might have been seen by Kepler. 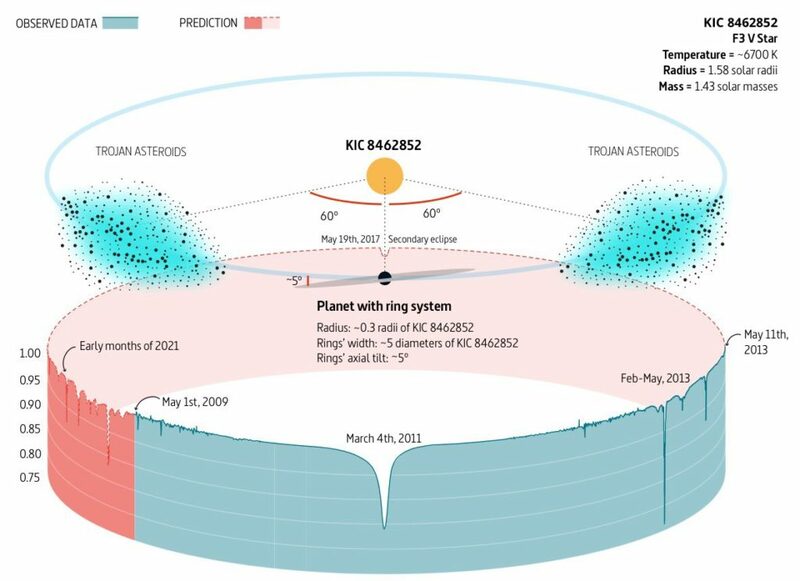 However, participants began noticing that the transits of KIC 8462852 were surprisingly large, complex and with no apparent periodicity. When Tabetha Boyajian, an astronomer at Lousiana State University, put all the various dips together into one complete light curve (a graph that displays how the star’s brightness changes over time) she found that it resembled no other star ever seen before. The transits would come in clumps, like swarms of large objects swimming across our line of sight. At one point almost a quarter of the star’s light was blocked. That’s a huge amount, especially when you consider that the transit of a Jupiter-sized planet would block just one per cent of the star’s light. That wasn’t all. Ben Montet of Caltech and Josh Simon of the Carnegie Institution found that besides the dips, the star had dimmed by several per cent over the four years (2009 to 2013) that Kepler had observed it. The story of Tabby’s Star then got even crazier, as Bradley Schaefer of Louisiana State University claimed that the star had been dimming in such a fashion for at least a century, based on his analysis of photographic plates going back to 1890. All manner of explanations have been proposed, from swarms of comets, interstellar dust clouds, giant planets with rings and extraterrestrial megastructures, but the star remains mysterious. The problem that any potential explanation faces is that it has to explain both the large transits and the years-long, perhaps century-long, dimming. So getting more data was key and, thanks to a successful Kickstarter project last year to raise funds, Boyajian was able to set-up a long-term observing programme with the Las Cumbres Observatory’s network of telescopes. There are hints in the Kepler data that dips happen roughly every 750-days, and based on this the next dip was predicted for this spring or early summer. The star hasn’t disappointed. A light curve showing the latest dip in light from Tabby’s Star. Image: Jason Wright. The beginning of the new dip was confirmed on 19 May, when the star suddenly dimmed by three per cent until 21 May, when it rose back to its normal brightness of magnitude +11.7. Astronomers sprang into action, with observations gathered by a whole armada of telescopes including the twin 10-metre telescopes of the Keck Observatory in Hawaii, the 11.1 x 9.8-metre Hobby–Eberly Telescope in Texas, the Large Binocular Telescope in Arizona, the 100-metre Green Bank radio telescope in West Virginia and the SETI Institute’s Allen Telescope Array in California. The results have yet to be analysed – it remains to be seen whether they will provide some long awaited answers, or deepen the mystery by prompting more questions. Although the timing of the latest dip suggests that the approximately 750-day period could be real, it’s still too early to be definitive. After all, we don’t even know if we are seeing the same objects transiting, or new objects. However, based on this assumption, astronomer David Kipping of the Harvard–Smithsonian Center for Astrophysics has calculated that the occulting object, if spherical, would have a minimum diameter of 1.6 times the star itself, and a mass two-fifths that of Earth. Although this sounds huge, an object of such diameter is not unprecedented. For example, when comet 17P/Holmes entered outburst in 2007, its coma expanded to be larger than the size of our Sun, albeit it was rather diffuse. It’s not clear how a comet, or even a swarm of comets, could account for Kipping’s estimated mass. A new theory suggests that a giant planet with rings and Trojan asteroids could explain at least part of the Tabby’s Star mystery. Image: Ballesteros et al. One new solution put forward by Fernando Ballesteros of Universitat de València and colleagues (https://arxiv.org/abs/1705.08427) is that the dips could be caused by an enormous planet that has a diameter of a third of the star itself, with an enormous ring system and huge swarms of Trojan asteroids in front and behind it in its orbit. The Trojans would cause the periods where the transits come in many clumps, while the passage of the planet and its rings in front of the star would lead to the smaller and somewhat smoother dips. 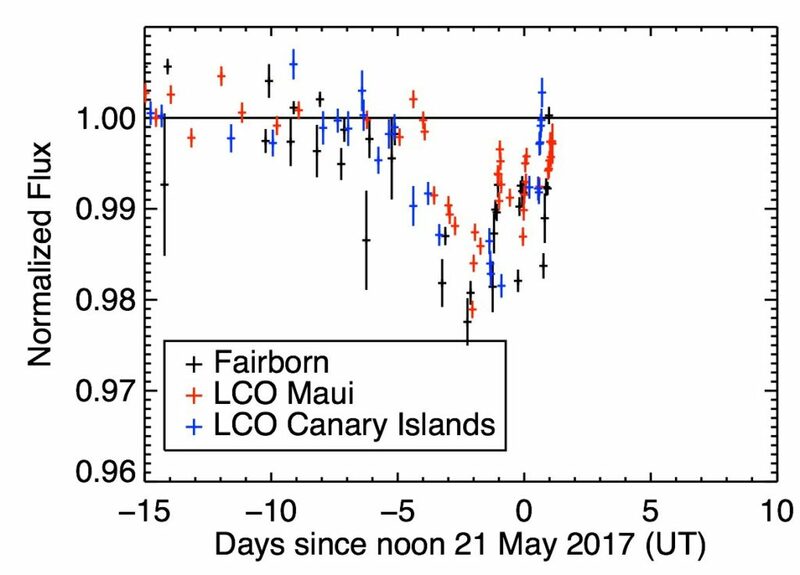 However, Ballesteros and his team point out that their hypothesis does not explain the overall dimming seen by Kepler and Bradley Schaefer. Also, such a huge planet plus the swarms of asteroids should produce enough infrared emission to be detectable, yet such emission has been noticeable by its absence. Furthermore, the amount of asteroids required would be so enormous as to have a combined mass of Jupiter, which would not only be incredible and difficult to explain, but also, as Jason Wright of Penn State University points out, likely to be unstable. Although the latest dip only lasted three days, astronomers remain on high alert. Previous dips have come in swarms, so another dip could be just around the corner. For a more thorough overview of the Tabby’s Star mystery, see the May 2017 issue of Astronomy Now. 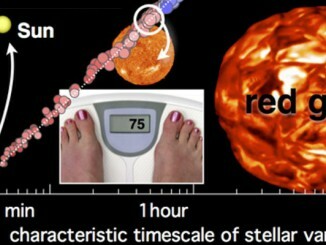 An international team of researchers have found a new way to measure the pull of gravity at the surface of a star. The new method allows scientists to measure surface gravity with an accuracy of about four percent, for stars too distant and too faint to apply current techniques. For remote stars with planets orbiting them, this information is key in determining whether any of those planets can harbour life. UPDATED: Are comet fragments best explanation for mysterious dimming star? A star called KIC 8462852 has been in the news recently for unexplained and bizarre behaviour. NASA’s Kepler mission had monitored the star for four years, observing two unusual incidents, in 2011 and 2013, when the star’s light dimmed in dramatic, never-before-seen ways. Something had passed in front of the star and blocked its light, but what? 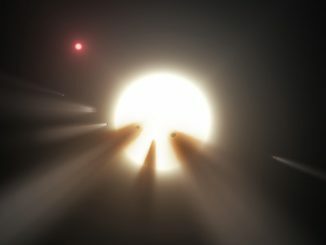 A star known as KIC 8462852 in the constellation Cygnus has been raising eyebrows both in and outside of the scientific community for the past year. In 2015 a team of astronomers announced that the star underwent a series of very brief, non-periodic dimming events while being monitored by NASA’s Kepler space telescope. A new study has deepened the mystery.